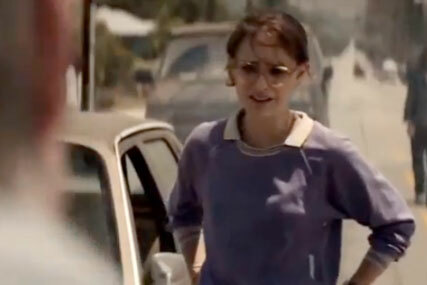 She may have played a beautiful ballerina in Black Swan, but blooming beauty Natalie Portman has gone from swan queen to ugly duckling in new movie, Hesher. NATALIE PORTMAN’S PREGNANCY STYLE PARADE! The mum-to-be – who’s hotly tipped to take home an Oscar at Sunday’s glittering Academy Awards – channels her inner geek in the indie movie, which premiered at last year’s Sundance Film Festival. A far cry from Black Swan alter ego Nina, gone are Natalie’s glossy locks and flawless skin, only to be replaced with dowdy clothes, thick glasses and thoroughly unkempt tresses. Natalie plays shy shop worker Nicole in the budget movie, who takes a young boy under her wing after the death of his father, and soon becomes the object of his affections. Unlike hit Black Swan, it’s thought the new movie was screened to mixed reviews, and has not yet been picked up by a studio. Will Natalie take home the all-important Oscar at Sunday’s Academy Awards? Let us know in the comments box below.